Gosh, I was wrong (it doesn't happen very often). 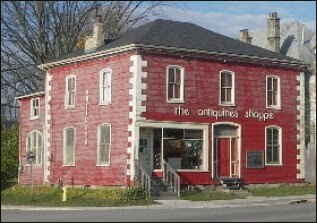 The "Antiquities" building appears to have been saved, as over 200 Londoners were willing to contribute money to preserve it. Now an agreement has been reached between Heritage London Foundation and The Pathways Skill Development and Placement Centre to restore the building for Pathways' use. The stabilization of the foundation has already begun. If you're not familiar with Pathways, they're an organization that provides skills training for the unemployed or underemployed in London. In other words, they're not a heritage organization. That's okay. That means we have a ground-breaking initiative here. Two organizations - one heritage and one not - have come together to save an interesting part of London's past. This is the kind of partnership we need to see more of in the future. Adaptive reuse here we come! You can check out the building (and the renovation process) for yourself during Doors Open London, Sept. 18 and 19, from 10 am to 4 pm. It's a rare opportunity to see inside one of our oldest surviving wood frame buildings. Update, March 23, 2011 - Renovations have now begun on this historic building. Two chimneys have been removed and soon the entire structure will be moved off its rotting foundation so a new one can be poured. Update, June 14, 2012 - The building is finally ready for Pathways to move in. An open house was held this evening so community members could check out this new old building. Awesome sight!